Young and family-oriented, Westfield features affordable housing and great schools. The downtown revitalization project currently underway will add even more amenities to this up-and-coming Indy suburb. The Monon Trail in Westfield. Established by a group of Quakers in 1834, Westfield is now a rapidly growing Indianapolis suburb located 25 miles north of Indy’s downtown. With more than 30,000 residents, Westfield offers a variety of housing—most of it newer—from starter homes in the low $200,000s to condos to large custom homes. Like many of Indy’s other suburbs, Westfield is in the midst of revitalizing its historic downtown. Dubbed Grand Junction Plaza and Park, the project includes gathering spaces, an arts garden, new retail and much more. 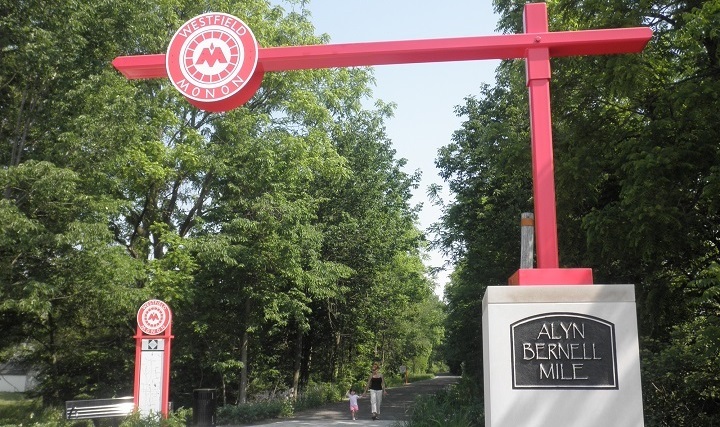 For recreation, the city holds over 70 miles of trails within its borders, including 5.5 miles of the popular Monon Trail. If you or your kids play sports, you’ll probably spend many hours at Grand Park, Westfield’s “sports campus.” Grand Park’s 400 acres feature a full-range of championship-level outdoor facilities for baseball, softball and field sports including soccer, football, field hockey and lacrosse. Young families are attracted to Westfield’s excellent school system, Westfield-Washington Schools. In fact, Westfield expects an influx of new students over the next few years, and voters approved two referendums in late 2016 and early 2017 to pay for hiring additional teachers, expanding programs, and improving school facilities. Are looking for top-notch public schools. Accept that higher property taxes come with school improvements. Want to live near a golf course—Westfield has several. Don’t mind a 45-minute commute to Downtown Indianapolis. Want easy access to the Monon Trail. Grand Park Sports Campus – One of the largest sporting complexes in the world, Grand Park fits 26 baseball and softball diamonds and 31 multipurpose fields within its 400 acres, as well as two indoor facilities to accommodate year-round play for a variety of sports. Yes, this is a sports mecca for kids and adults alike! Dining, retail and entertainment venues are planned for the perimeter of the complex, making it even more of a family destination. 19000 Grand Park Blvd. Freedom Trail Park – Freedom Trail Park was built to include children of all abilities, including those on the autism spectrum. Playground equipment is outfitted with harnesses and ramps, and a sensory garden includes elements that appeal to the senses. Surrounded by prairie grasses, trees and flowers, the park is a lovely respite close to Downtown Westfield. 500 Deer Walk Trce. Rail Epicurean Market – Rail Epicurean Market, located in a renovated barn with an atmospheric patio, serves artisan foods from local vendors, including Smoking Goose, Traders Point Creamery and Joe’s Butcher Shop. The menu changes with the seasons, and the food is always fresh and flavorful. Try the sugar cream pie, a Hoosier delicacy! 211 Park St.